Peugeot has bestowed the obligatory mid-life facelift upon the 208 hatchback, giving it a sharper looking front end and, more importantly, a diesel engine capable of 94.2mpg and 79g/km CO2. 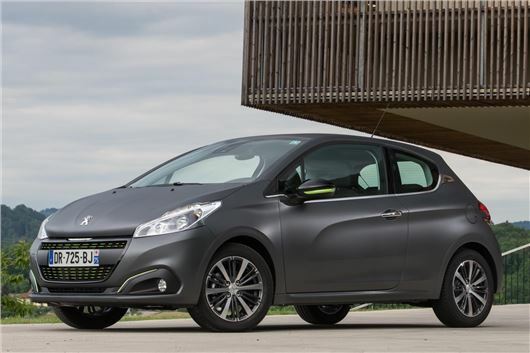 Available to order now, with prices starting at £11,695, the new 208 comes with a world first too, albeit a slightly dubious one: the matte-finish "textured paint" you see above is "a world first technology on a volume production vehicle," says Peugeot. In fairness, the intriguingly different paint job costs the same as pearlescent paint (£645), requires no special maintenance and does look quite special. Aside from some tweaks to the styling to make it look a little wider and chrome-centric, the entire 208 range has had an engine upgrade, with Peugeot swapping out the original engines for updated, Euro 6 compliant units. The most statistically impressive is the aforementioned claimed 94.2mpg 1.6-litre BlueHDi diesel with a five-speed manual, which develops 75PS. There’s a 100PS version of the same unit, and a 120PS one too – even that one emits just 94g/km. Petrol engines are all three-cylinder units, with the 1.0-litre version developing 68PS and the 1.2-litre 82PS. There’s a turbocharged version of the latter as well, rated at 110PS and available with either the standard five-speed manual or Citroen’s six-speed automated gearbox. That engine emits 103g/km or 104g/km CO2 respectively, giving you an indication as to how efficient the entire 208 range is – GTI aside, that is, which pumps out 200PS but in exchange manages and official 47mpg, or half what the most efficient diesel can. Available as a three or a five-door (apart from the three-door only GTI), the trim hierarchy is as before – Access, Active and Allure – but is now joined by a new GT Line specification, which copies the move Peugeot made with the bigger 308, adding sporty touches without the associated power. Air conditioning and Bluetooth are standard, and Peugeot has seen fit to make automatic low-speed emergency braking (Active City Brake) and a reversing camera available to the range; retail customers that order a mid- or high-level 208 early will get these options free, worth £900.